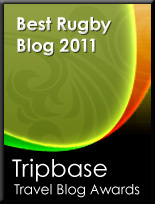 Followers of rugby are occasionally referred to amongst the less enlightened classes as "eggchasers." Eskimo Rugby today has a feature on the new Mitre training ball which certainly won't help on that score. Called the Reload, the ball has a "rounded" end which, it is claimed (in theory at least), allows a rugby player to practice on his own - passing and kicking against a wall for instance (as with a football) - the idea being that the ball will bounce straight off the wall back to the player without flying off at crazy angles. 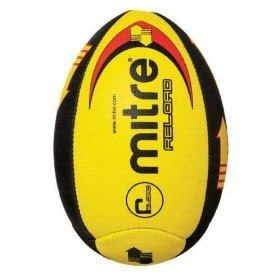 According to Mitre, this exclusive rounded end rugby training aid is popular at all levels of the game and can be used as a warm up and skills developer whilst also being suitable for players to train on their own. The ball, they say, is excellent for spin and distance passing, catching practice and line out throwing and can also help develop drop kick techniques. I honestly don't believe that if you pass or kick this ball against a wall it will bounce back to you (unless you stand really, really close to the wall). Surely once the ball hits the ground it will, unless it miraculously happen to bounce on its rounded end every time, be subject to the unpredictable nature of a bouncing rugby ball? Even if the ball did bounce back to you, surely the whole point (if you'll excuse the pun) of a rugby ball is that it is unpredictable. Can practising with a ball that has a predictable bounce help that much? If so, why not just practice with a football? It just looks SO wrong. If John O'Neill gets wind of this, how long before the ball is trialled as a match ball on global scale? 5. Spin and distance passing are in themselves the reason why the backs drop so many balls. The forwards win the ball and everything’s going fine until some flashy idiot slings a rapidly spinning ball at 100mph expecting some guy with freezing cold hands to catch the bloody thing at the same time as running flat out and trying to spot the gap in the defense. Please, please do not teach people to throw spin passes; it looks clever but it’s not half as effective as a simple straightforward, accurate pass over a few metres to the hands of the player who wants it, and then following round to support him. Tacky little waste of money. Mitre balls used to be what Gilbert balls are today ... but playing that ball was like playing with a bar of Soap! Well those were the days where real Prop had Guts ... a lot of it! Are you guys mad! It is great product! You improve your ball handling skills/confidence and excellent drop kicking technique can be developed by first dropping onto the rounded end.Great for youngsters an even the Welsh national team (seniors) have trailled it and they use the reload. Excellent for developing confidence/ability on the ball and most of all skill! I agree with the last post. You dinosaurs need to wake up! this is a great innovation. I am a rugby coach and i use this product all the time in drill work. The kids love it, some have their own.Really bebficial. Good product! Bought one last year and use it regularly. I take it you meant 'very beneficial' -Anonymous haha. Ha ha. Shouldn't really comment or review a product you obviously haven't used. It does work, bought one for my son last Christmas, so there! Why not get one and try it. Then write a proper review? Great blog by the way! Hey TF! Either someone from Mitre has been on here posting anonymously or people actually like the 'reload'! Interesting eh?